Are you looking for latest Android Oreo ROM for your device?? Well, let me tell you, Android Oreo source code has been uploaded to the AOSP and here is a list of AOSP Android Oreo ROMs for many devices brought by various developers across the globe. How do you know when your device is getting the Android Oreo AOSP ROM if it not listed here?? Just stay subscribed to this page which will be updated almost daily with latest Android Oreo based AOSP ROMs list. 3 What is an AOSP ROM?? What is an AOSP ROM?? Well, AOSP is the stock Android or you can say the vanilla Android which is release by Google. 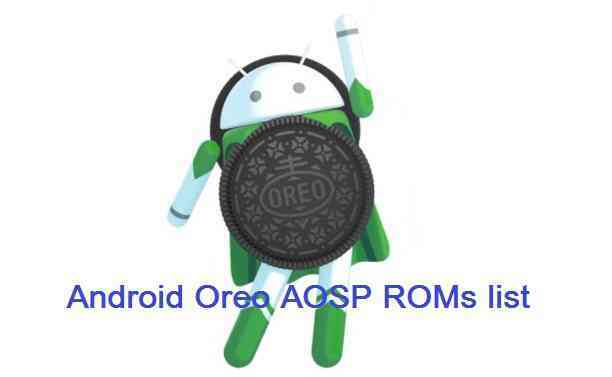 This page lists the AOSP ROM based on Android Oreo (Android 8.0), which is the latest Android version. AOSP ROM is a raw Android without any added features on top of it unlike other Custom ROMs like: LineageOS, Resurrection Remix OS, Omni ROM, Legend ROM etc. As always the AOSP ROM does not come with pre-installed GApps (Google Applications) because of Copyright issue and also there is no inbuilt SupreSu binary which allows the ROOT access. So, you need an extra Android Oreo GApps and SuperSU ROOT for Android Oreo, which has to be flashed after flashing the AOSP (Android Oreo) ROM. As Android Oreo AOSP is just now released to public, the list will be updated as more and more ROMs will be made available. If your device does not have an Android Oreo update, then you can have a look on some other custom ROMs based on older Android versions in any type. Why Lineage OS 15 has release for redmi 3s before redmi 4x get the LOS 15 ? can i use the LOS redmi 3s on my Santoni? cause i was try flash Oreo Rom from russian forum but it has much bugs.. Most of the LineageOS 15 or any other custom ROMs are built for many devices initially by individual developers. Hence, it is the popularity of the device and interest of the developers that defines the availability of custom ROMs for various devices.